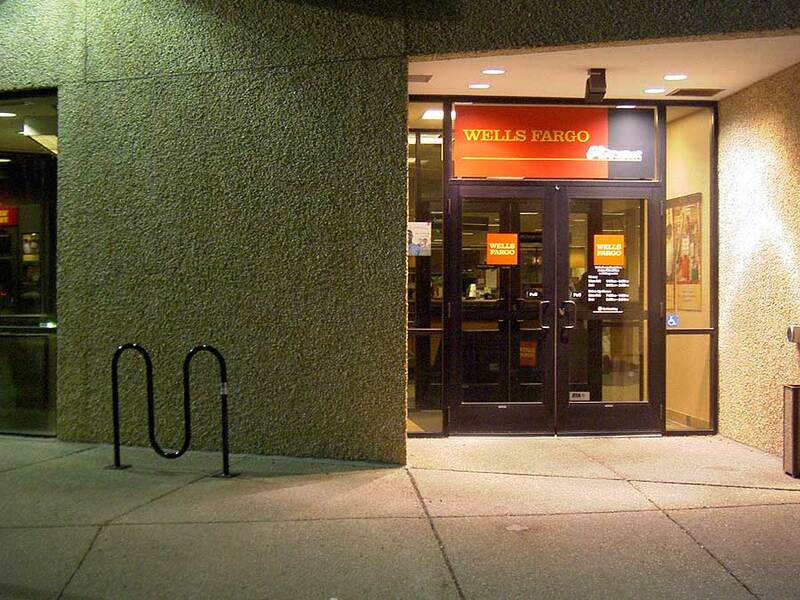 Long time readers may recall my low-level argument with Wells Fargo and their policy of not accepting deposits from bicyclists in the drive-through lanes. Wells Fargo, apparently wanting to inconvenience their bicycle-riding customers as much as possible, suggested that I just go inside the bank. There's no bike parking at the Arden Hills branch, I said. It was suggested that I just take my bicycle inside with me and if the staff has any questions say I'd been instructed to do this. This has been a slowly-evolving story, and I thought the next move (besides using the drive-through ATM to make my deposit, just as quick and they can't refuse to accept it) would be to ride in in mid-January with my studded knobby tires and filthy bike dripping snow, slush, salt and grime on their carpets and cheerfully say that I'd been instructed to do this rather than use the drive-through lane. I discovered last winter that the bike will retain a lot of filth and drop it pretty quickly when it warms up (I found this out at church, where I'd park it by a floor drain). Curses! The canny bastards have put in a bike rack at Arden Hills! No excuses about no bike parking. 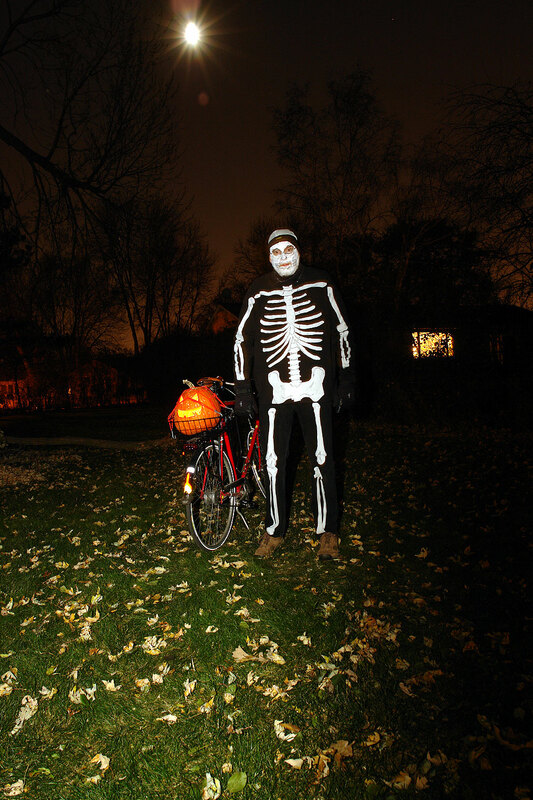 Last year, on a whim, I made myself a skeleton outfit out of black Levis, a cheap black sweatshirt, a Mayo Clinic Health Guide and some iron-on interfacing, then rode around on my bicycle cackling at people with a pumpkin on back. This was good fun. 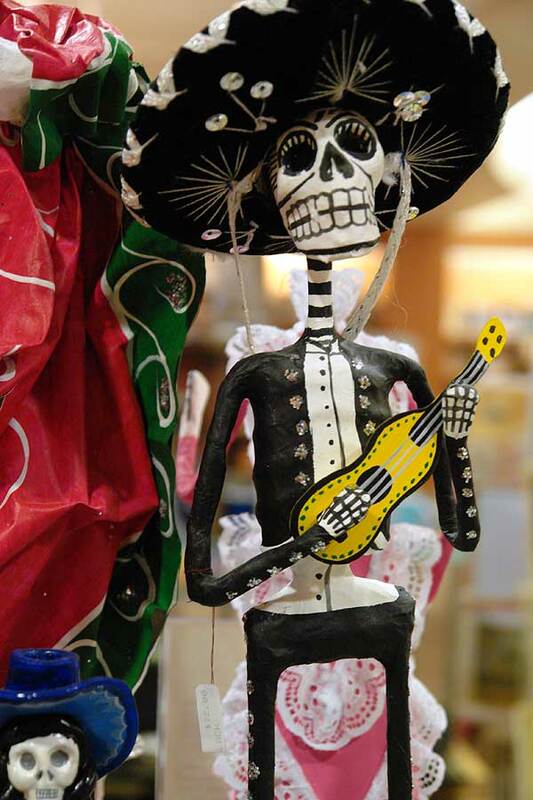 I got my inspiration in part from the Mexican Dias de los Muertos (Day of the Dead) celebrations, which tend to be exuberantly colorful. This one was in the Museum Shop at the Minneapolis Institute of Art. I decided to do this again. First, we had to get the pumpkins ready. We have a huge yard with a back gate, so have a couple back there, a couple by the back door and one by the front door, plus I needed one for the bicycle. 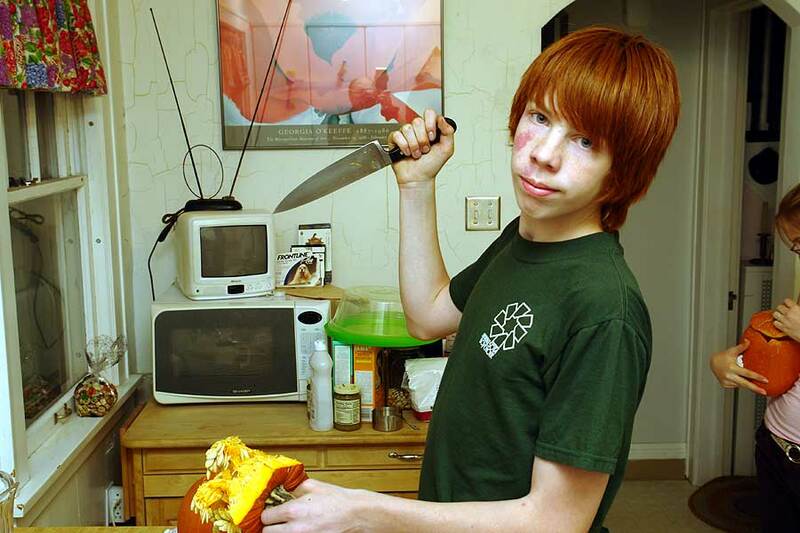 I pressed Henry into service doing pumpkins. And here I am. Got to add fingers to my black gloves. 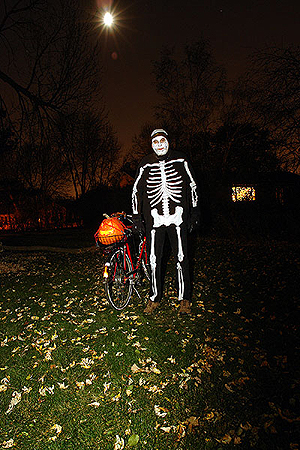 When I first tried this last year, I used an REI candle lantern to illuminate the pumpkin. This turned out not to work very well. I switched to using several red blinkie lights and that works great. In this photo, I have six of them blinking away inside the pumpkin. Of course, they all blink at different rates so you get this cool flickering effect, much better than an actual candle. The quick feedback of digital is great! This is with my new Sony DSC-R1 camera, my first "serious" digital, giving me the flexibility to use external flash and set manual exposures. I rode about 10 miles all in all. 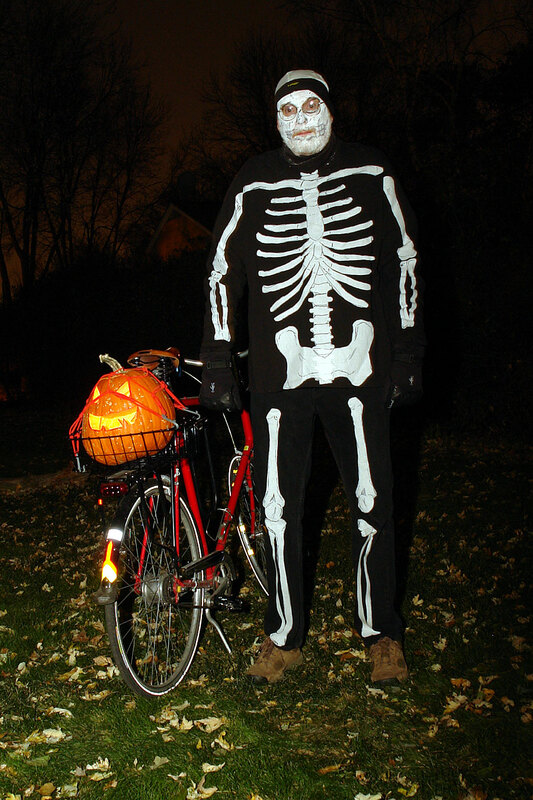 I prefer to ride towards people and grunt or recite some doggerel like Ghosties Big and Ghosties Small, Skeletons are the Worst of All and then cackle and throw a candy bar at the smallest kid. 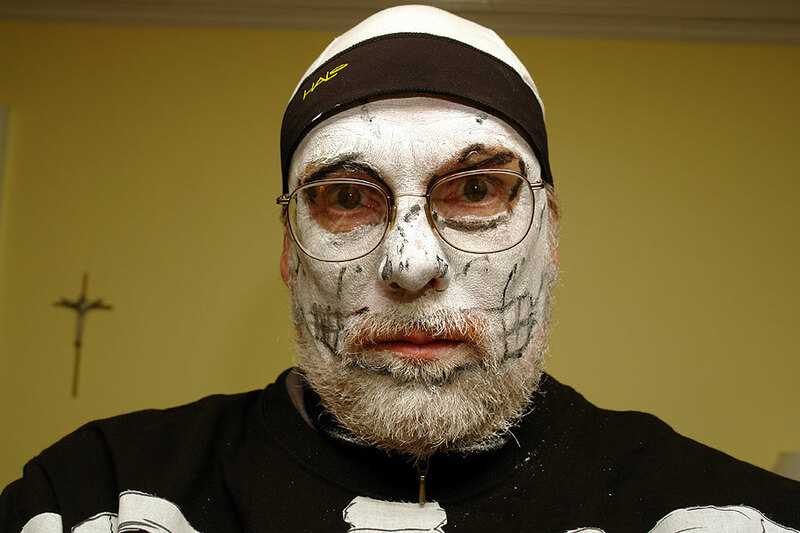 Sometimes I just grunted, sometimes I stopped and handed out candy. Unlike last year, nobody came out and gave me a beer. I don't think it actually frightens anyone under 6, but it sure startles the hell out some folks! I think it adds to the light-hearted neighborliness as well. The makeup looks better from a distance!